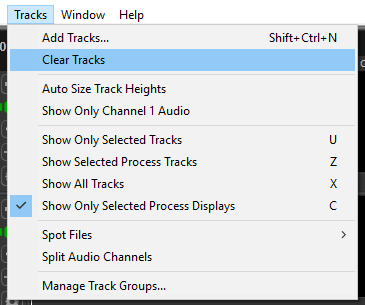 The Tracks menu contains a number of functions for adding, clearing and viewing tracks. A contextual menu of some Track-based functions can be accessed by RIGHT CLICKing in an "empty" area of the Track Control panel as shown at right. The selectable items includes Insert Track and Delete Track, which are self explanatory. The last menu items, Add Markers and Enable Layers, provide further useful functionality. 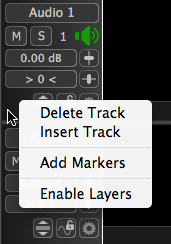 See Marker Tracks, Audio Layers. Tracks can be re-arranged in the Session window by holding down the LEFT Mouse button in an empty area in the Track Control Panel and, with the Hand icon, dragging the Track's "ghost" up or down and dropping it in another "destination" Track Control Panel. If the "ghost" is dropped in the top half of the destination track's window - the dragged track will be placed above the destination track. If the "ghost" is dropped in the bottom half of the destination track's window - the dragged track will be placed below the destination track. Tracks can be inserted with the Tracks menu Add Tracks... command: CMD SHIFT N (Mac) / Ctrl SHIFT N (Windows). The number of new tracks and their base name can be entered in the window subsequently displayed. Each consecutive track so created will have an incremented number in brackets after the name, e.g. Audio, Audio(2), Audio(3), ... Audio(n). Track heights can be resized by selecting anywhere on the thick horizontal separator line between tracks and when the up/down arrow icon appears, hold down a LEFT CLICK and drag the line up or down to increase or decrease the Track height. If the SHIFT key is held down, ALL the track heights will be adjusted at the same time. Pressing it again will restore the multi-track display. 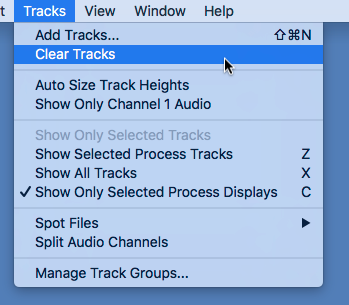 Tracks can be "Cleared" of all Audio and Processes by selecting Clear Tracks command in Tracks menu. The Tracks layout and Track Control Panels will be preserved. This command can be used to create Session Templates (Click here for information). To show only Tracks used by the selected Process, press the Z key. To show all the tracks, press X key. To toggle hiding the Displays of processes that are not selected, press the C key.